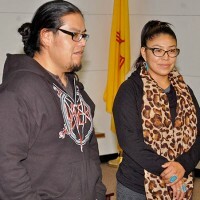 In recognition of Native American Heritage Month, young guest speakers and Native American actors, Loren Anthony and Goldie Tom hosted the Nov.9 viewing of the documentary, “Reel Injun: On the Trail of the Hollywood Indian,” hosted by Gallup’s Octavia Fellin’s Public Library. The documentary explains the evolutionary roles in which Native American stereotypes have been cast in past and present films, and why these particular stereotypical roles are still harmful to the image of Native Americans today. To an audience of 32 community members, Anthony and Tom discussed after the documentary and how it parallels with their recent highly publicized walk-off of the Adam Sandler movie, “Ridiculous Six,” this past April. The film, “Ridiculous Six,” is a western slapstick comedy film, starring Sandler, about an outlaw that reunites with five of his brothers as they are encountered by Native Americans. It is scheduled for release on Netflix Dec.11. Anthony, having been brought up in a traditional Navajo family, and knowing the grim reality of statistics stacked against Native American women and its youth were just a few of the reasons he gave for walking off the set before his role in the film even began. Goldie Tom, Anthony’s good friend, originally from Iyanbito, NM, but lives in Gallup, was also one of the cast members who walked off the set that day. She credits Anthony for getting her into films because she went with him to different auditions and has experience as an extra in some short films. She and Anthony said they started witnessing things on the Sandler set such as teepees facing the wrong direction, teepees with two entrances, and teepees with scalps on top of the teepee poles. Additionally, feathers were laid on the ground, and Navajo baskets were placed on the ground with bear skin rugs. Even though the film did not set easy with him, he understood why the other Native American cast members chose to stay. He said many stayed because jobs are hard to find and he knows the beginning struggles of becoming an actor. Speaking from experience, Anthony has been acting for a while now, gaining some drama experience in high school and pursuing theatre for four years. He was also part of a heavy metal band that toured nationally and internationally, which gave him a clear insight on how the industry worked. When he had some time to land some auditions with people that he met, his first audition was for the film, “The Lone Ranger,” which he eventually was hired. He said there was a big difference working on the set of “The Lone Ranger” as compared to the Sandler film. For Anthony, in the beginning it was exciting to know that he was going to be part of a film with Sandler, considering he loves doing stand-up comedy himself, not expecting things to turn out the way they did. He was even more surprised that for Adam Sandler, with Jewish roots, an ethnic background who has been through a genocide themselves, did not understand the sensitivity of the issue. “When you are pointing someone out, and saying, we are going to laugh at you, we are going to laugh at your people, we are going to laugh at your culture, we are going to laugh at your traditions, and then we are going to make fun of your women, and your children … in the end, people don’t understand why we had to walk out,” he said. After reportedly being turned away from talking to Sandler, Native cultural consultant, Bruce Klinekole, was the first to walk off the set. Tom said that the producers and directors were not listening to him. Then a group of Native Americans cast members, Tom explained, went to the directors and tried to negotiate with them but they were not willing to change the script. After the walk-offs of a handful of cast members, the mainstream media caught wind of the walk off, and from there, the situation grew intense. Anthony said he was followed to work and the television station, TMZ, followed him to Crownpoint High School at one time. He claimed he even got death threats from various people. However, looking back on it now, he has no regrets. As for Tom, she felt uneasy about her role in the film from the beginning, and as her role as a cosmetologist in making women feel good about themselves – unlike how she felt the movie portrayed Native American women. After graduating from the University of New Mexico’s cosmetology school, and obtaining her cosmetology license, she set off in her own ventures as a freelance makeup artist and hairdresser. One of her most recent accomplishments are she recently went to New York City’s fashion week, during the spring and was invited back for the fall. With the movie’s release date scheduled for next month, it has been arranged through Netflix that it will produce three more sequels to the movie. Anthony is okay with that considering that he knows Native Americans love seeing their people on film but he wants to remind them that they ultimately have the resources and knowledge to make their own films. “It just takes one person to say, ‘enough is enough.’ And if we get enough people on board, then the world will listen and say ‘hey these natives are something, they do have a voice,’” he said. Anthony says that he feels the respect now from non-Natives since being on a recent audition for a movie in Hollywood. The crew broke out some smudge for him and he thought that it was interesting because they said they really wanted him to be a part of this movie, so they tried educating themselves. Even though it was not a Navajo thing, to him, it spoke volumes versus other times he went to other auditions and they would ask him if he could ride a horse or how long is his hair. He feels that things are changing but it will take some time. Today, life continues for both actors. Anthony will continue his dedicated work with the youth, partaking in motivational speeches, lifting weights and he will continue his pursuit for more accurate Native American roles. Tom will continue to pursue her cosmetology dreams by spreading her positivity and creativity throughout her communities. Her ultimate goal is to do special effects in movie industry one day. “That is where I am at in my life right now and just trying to the whole hair and makeup thing. That is where my path is going,” she said. Overall, Anthony knows that there are a lot of people that are Native American that would disagree with the decision of walking off the Sandler set, but yet he feels that they do not have anything to justify why they are right. He says people can say it is just comedy or it is just for fun but he feels that it is to the point where it just it has not hit them personally. 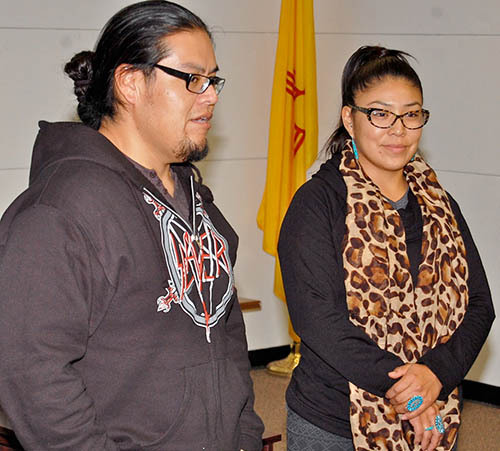 At the end of the documentary and discussion, a Window Rock community member, Edsel Pete, an actor himself, asked both actors what is the core message that they are striving to convey and maintain from the continuity of their actions.